The Clicker Apps family provide a range of writing support tools to support the diverse learning needs of all students in your classroom. Each app has different features and functions to support students to develop writing one step at a time. Those that are familiar with Clicker 6 (the full featured computer software program), will recognise many of the writing tools used within these apps. The preview webinar will give you a quick overview of each of the Clicker Apps, while the full webinars will give an in-depth demonstration of Clicker Sentences, Clicker Connect, Clicker Docs and Clicker Books. A quick overview of the Clicker Apps – Apps which can support writing skills of many learners. 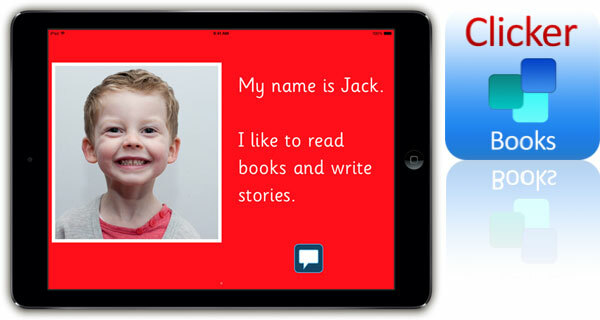 The Clicker Sentences App supports children to build their first sentences using words from a grid. It is perfect for emergent writers or even those older students who are struggling with some basic literacy skills. It features: speech feedback, different options for modelling sentences, child-friendly simplified keyboard and the ability to use pictures to support the writing. This webinar will demonstrate this app, with practical ideas and you will see how easy it is to customise content for your learners by creating your own sentence grids. The Clicker Connect App supports independent writing skills by offering words and phrases within a grid. 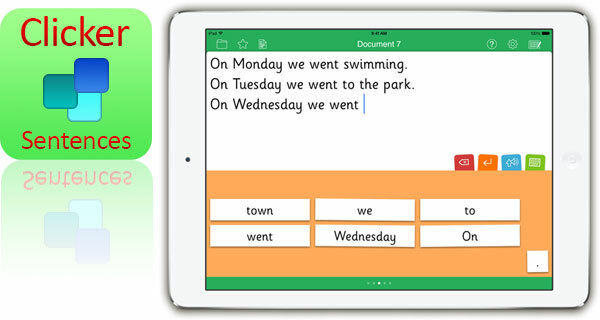 Children can use different writing tools within the app as they build sentences and compose longer text. It is perfect for developing writers and struggling writers, or even English language learners. 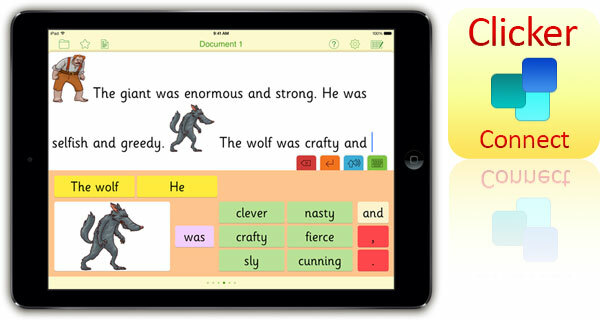 It features: speech feedback, colour-coded cells, child-friendly simplified keyboard and the ability to use pictures (the Crick Picture Library is included) to support the writing. This webinar will demonstrate this app, with practical ideas and show you how much flexibility you have in designing your own writing support grids for the learners in your classroom. The Clicker Docs App is better than your average word processor, with its in-built, easy-to-use writing supports, such as word prediction and word banks. It encourages independent writing which makes it suitable for all students of all abilities, as well as those students in our classrooms that struggle with writing and spelling. It features: speech feedback, word banks, word prediction, talking spellchecker and child-friendly simplified keyboard. This webinar will demonstrate this app, with practical ideas and you will see how easy it is to create your own word banks for writing about any topic in the classroom. The Clicker Books App allows us to create books. In-build writing support tools mean that students can create their own talking books. Teachers can also use this app to create teaching materials and books for students in their classroom. It is suitable for all students of all abilities, as well as those students in our classrooms that struggle with writing and spelling. It features: speech feedback, word banks, using pictures to support writing, word prediction, child-friendly simplified keyboard and sound recorder. This webinar will demonstrate this app, with practical ideas and you will see how you can create books that allow students to READ, TALK, ILLUSTRATE and WRITE; essential skills for all literacy learners. Hi I was wondering if you can tell me if Clicker connect has the spelling predictor as Clicker Docs does. clicker sentences is great but if you want the child to add another sentence independent of choosing from the words in the grid there is no spelling support. Does Clicker Connect bridge that gap? Clicker Connect unfortunately does not include word prediction, this feature is only available via the Clicker Docs app. Using iPads to Support Older Students Struggling with Literacy | Full day Video!